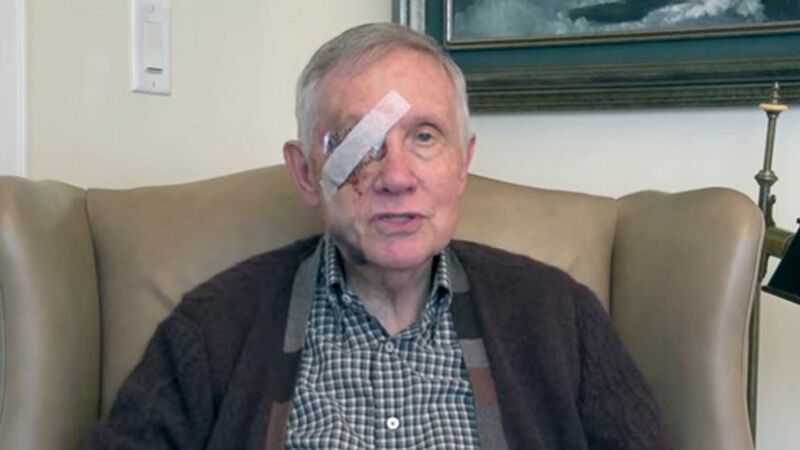 Senator Harry Reid after his exercise accident. This story is all over the internet, so I’ll just add my two cents. While Senator Harry Reid was exercising with an exercise band, it broke, hit his eye, causing him to lose his balance, and take a bad fall. He hit his head on nearby equipment, breaking bones near his right eye. He was also diagnosed with a concussion, and broken ribs. As of today, medical reports say that he may lose vision in his right eye. CAN AN EXERCISE BAND CAUSE BODILY INJURY? Do not hold the band In front of your face. Indeed it can. In fact, any type of exercise equipment can cause injury if not used carefully. Elastic bands seem innocuous, because they’re non-imposing, they don’t intimidate, they almost look like a child’s toy. Senator Reid is 75 years old. He was standing while exercising with an elastic band. Either he pulled the band beyond a safe range, causing it to snap, or the band may have been overused, and should have been replaced. He then lost his balance, and fell head first onto exercise equipment in his home gym. 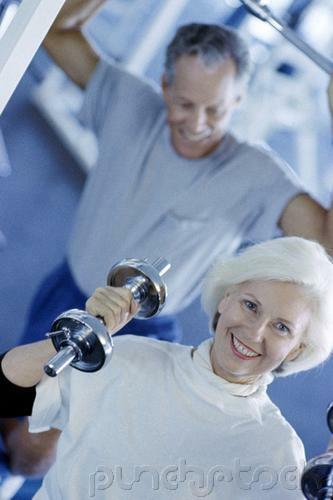 Persons over 65 should use great care while exercising to prevent accidents. 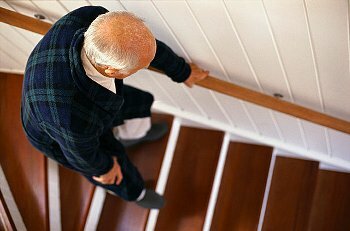 Loss of balance is more likely in an older adult. Do not pull the band beyond its’ capacity, causing it to break. Do not stretch the band beyond its’s limits. Don’t use the band while standing, if you think you might lose your balance during exercise..
Don’t hold the band near your face, especially close to your eyes. If it breaks, you can suffer an eye injury. Don’t use the band if you have long fingernails, because they can puncture the band with holes, causing the band to break while in use. Don’t wear jewelry while using the band, to avoid puncturing the band. Don’t let your kids play with the bands. Elastic bands are not toys. Don’t allow distractions while you’re exercising with bands, and all other equipment. Stay focused on what you’re doing. Don’t store your exercise bands near heat or sun. Store them in a cool, dry place. Keep the bands away from dogs and cats to prevent injury to your animals. Replace bands after extended use. Copyright 2015 Irene Pastore, and Tour de Core Personal Training. I hope my older clients, and their caregivers, are inspired by this post about Lisa Modlich, an 88-year-old American, senior athlete, and world table tennis champion from Houston, Texas. During most of her life, she played outdoor tennis, but switched to indoor table tennis around 20 years ago. Modlich maintains an active lifestyle, and advises others to get up and keep moving. Ping Pong: You’re Never Too Old For Gold, is the title of a new PBS documentary, making its U.S. premier on September 9, 2013. 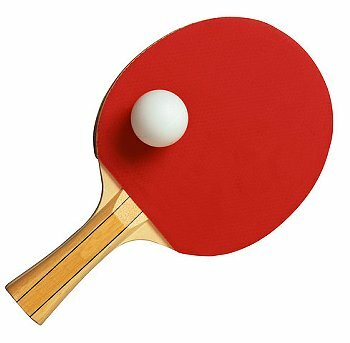 The film covers Modlich’s career, along with several other senior table tennis athletes, who range in age from 81 and up. Dorothy De Low, is a 100-year-old former world table tennis champion from Australia. Known as The Grand Old Lady of table tennis, she started playing after her husband passed away. Watch a clip of her game on You Tube. There are many types of Yoga poses: standing, seated, twists, balancing, lying on your back, abdomen or side. Balancing poses may be done while standing, seated, or on your hands. Yoga can strengthen overall, and deep core muscles that are important for maintaining good balance. 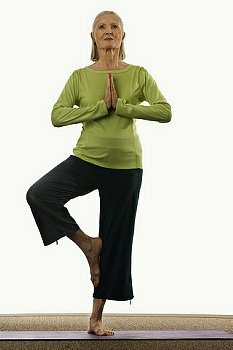 If you’re over 55 and would like to learn a beginner level standing balancing pose, consider the Tree Pose a good choice. The pose can be modified to suit individual ability. Set up the pose as shown in the photograph above. Stand on your right foot for 10 to 30 seconds. Repeat on your left foot. If you’ve never balanced on one foot, it might be difficult at first. Just keep practicing, and don’t overdo it. It’s traditional to do Yoga barefoot. However, if you feel more comfortable wearing shoes, that’s fine, as long as the soles are non-skid. Practice the Tree Pose on a non-slippery floor. If you want to invest in equipment, purchase a sticky mat. Go barefoot while using a mat. Socks can bunch up on a sticky mat, and cause you to trip. Stand facing a wall. Place both hands on the wall for support, instead of having your hands in front of you. Hands are shoulder width apart. Place your foot on the lower part of your leg, instead of higher up.